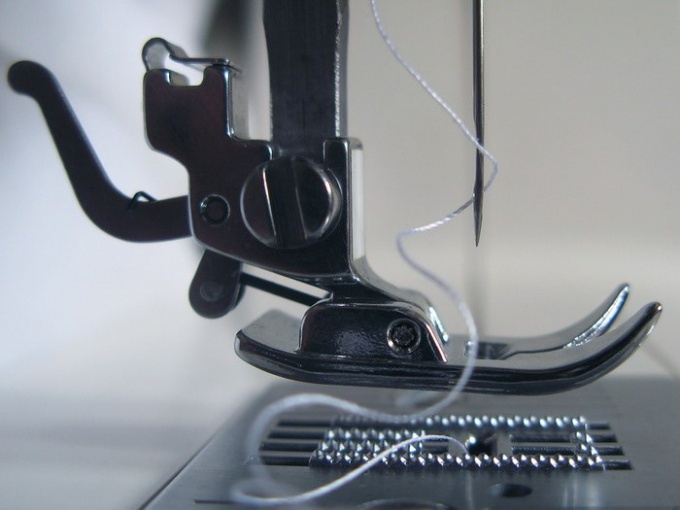 Before starting work on the sewing machine, you must correctly fill the upper and lower thread to adjust the tension of the threads, set the step size and the type of stitch. One of the important steps in this algorithm is the refill of the Shuttle. Vertical Shuttle more common, it is used in industrial and cheap cars. To fill on the sewing machine Shuttle, you need to wind thread on the bobbin. To do this, swipe the thread through the winding mechanism, slide the thread into the hole of the bobbin, make a few turns manually and set the bobbin on the pin. Switch the device to spin yarn and turn on the sewing machine. If you want to strengthen or weaken the tension of the lower thread, turn with a screwdriver the screw on the bobbin case cap and check the thread tension. It should not go too loose, not too tight and allowed the pulling of the thread, otherwise it will break during stitching. Insert the vertical Shuttle in the Shuttle device with the tail up, so it fits snugly into the groove. Scroll through the flywheel to the top thread to catch the thread from the Shuttle, pull both threads to the foot of the sewing machine. The horizontal Shuttle vertical more comfortable and differs from it in the fact that the bobbin is inserted from the integrated Shuttle. Through the transparent window you can always see how much thread left on the bobbin. The tension of the lower thread in a horizontal Shuttle takes place automatically. All you need to do to run the sewing machine hook is to open the lid of the platform and insert the bobbin in from the top then close the lid. Winding thread on the bobbin takes place without removing the fabric from under the presser foot and remove the thread from the needle. During sewing the thread from the spool will hit the road, he would not allow her obfuscation and will make the ride quieter. The choice of the sewing machine very often reduced to the selection of the Shuttle. It is important to understand what purpose are you purchasing a sewing machine, in order to choose the right type of Shuttle. The simplest vertical Shuttle oscillates. Typically, these shuttles are equipped with cheap sewing machines. The bobbin is placed in a special metal capsule, then the capsule-Shuttle fits into the bowels of the machine. Installation of the vertical Shuttle is relatively easy. The habit this step may take some time. The main disadvantages of the "swinging" Shuttle traders think low speed stitches, noise, the need for constant maintenance. In addition, the vertical shuttles sometimes confused with the lower thread, and opportunities for fine adjustment of its tension is not provided. However, if you are just beginning to sew, becoming the first sewing machine and don't want to spend too much money, don't be scared of the vertical Shuttle. High speed pretrazivanja matter, you will likely not be needed in the first phase, with the installation of the Shuttle enough to understand once (very important not to forget to raise the needle as high as possible, to prevent problems with installing the bobbin), and to the noise you quickly get used to it. If your machines horizontal hook, it does not mean that the machine does not require periodic maintenance. 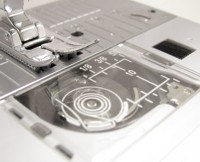 Remove dust and lubricate important parts oil, if you want the machine lasts a long time. Rotary horizontal hook most often found in non-professional sewing machines of an average price category. It is more convenient than the vertical, if we are talking about installing. 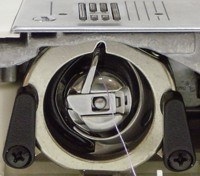 In fact, the bobbin is inserted into the housing of the typewriter without additional metallic capsule. Usually it's covered by a translucent plastic plate that allows you to visually assess the remaining quantity of yarn on the bobbin. The horizontal Shuttle reduces vibration to a minimum, respectively, of the noise it produces is also much smaller. Shuttles of this type do not require lubrication. The threads here are confused less often. Unfortunately, the tension of the lower thread here is also quite difficult to adjust. Horizontal shuttles are installed in cars with a starting price of about eight thousand rubles. Buying a machine with a similar hook, you a bit easier on yourself. The type of Shuttle should not be the only criterion when choosing a machine. Note to other functional features. There is a third type of hook is vertical Shuttle dual obecanja. Such shuttles are used in the professional machines of the highest price category. These shuttles are very reliable, they reduce the vibration to nothing, eliminate the tangling of threads, allow good to adjust the tension of the lower thread. Moreover, such a hook allows you to scribble with a very high speed. 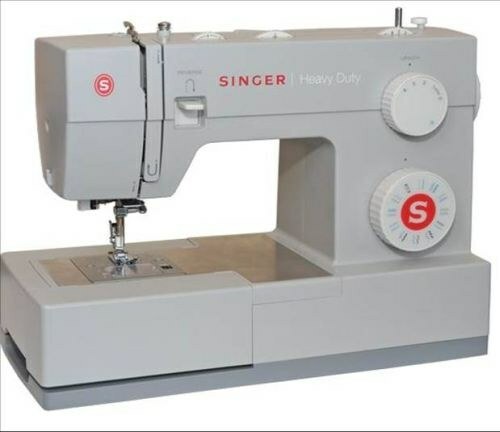 If you plan to sew professionally, you should think about buying machines with this type of Shuttle.